The former head of the president's now-disbanded vote fraud commission touched off controversy with claims of large-scale illegal voting. President Donald Trump on Monday endorsed Kansas Secretary of State Kris Kobach, one of the country's most prominent champions of unsupported claims of widespread illegal voting and former vice chair of the president's defunct vote fraud commission, in the state's GOP primary for governor. "Kris Kobach, a strong and early supporter of mine, is running for Governor of the Great State of Kansas. He is a fantastic guy who loves his State and our Country — he will be a GREAT Governor and has my full & total Endorsement! Strong on Crime, Border & Military. VOTE TUESDAY!" Trump tweeted. Kansas voters head to the polls on Tuesday in the gubernatorial primary, in which Kobach, along with five other Republicans, is vying to unseat GOP Gov. Jeff Colyer. The Democrats also have a crowded primary, with five candidates competing for votes. Republicans reportedly lobbied Trump to not back Kobach, an immigration hard-liner, fearing that it could give him the nomination and hurt their chances in November against the Democrats. 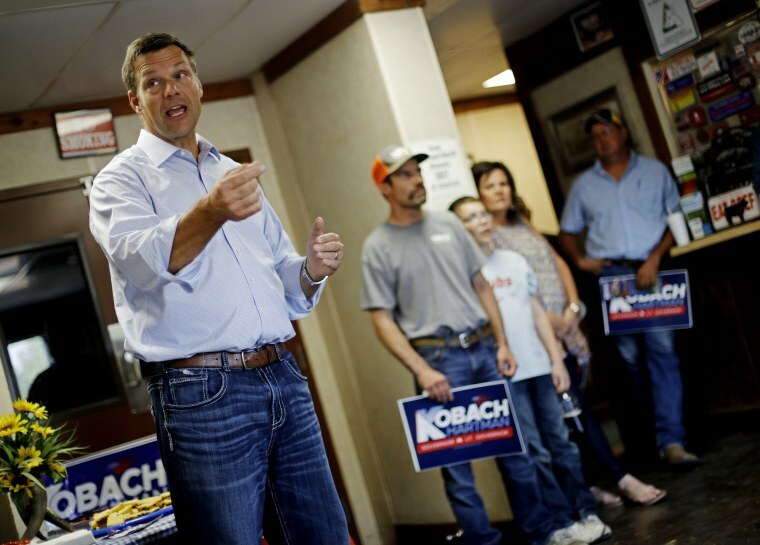 Kobach's work on Trump's vote fraud commission sparked controversy, internal skirmishes and a backlash from red and blue states after he requested sensitive voter roll data from them. Kobach last year cast doubt on the 2016 election results, saying he was unsure how many votes Hillary Clinton or Trump received due to the possibility of fraud. "You know, we may never know the answer to that," Kobach told MSNBC’s Katy Tur when asked whether he thought Clinton "won the popular vote by 3 to 5 million votes." Clinton won the popular vote by about 3 million votes and there has been no evidence of any significant fraud. "And so, it's impossible to ever know exactly, if you took out all the ineligible votes, what the final tally would be in that election," he said. Trump shut down his fraud commission in January after roughly eight months, citing the legal battles the panel faced. Documents released by a Democrat on the commission last week uncovered no evidence to prove the president's claim that millions voted illegally in the 2016 presidential election. Earlier this month, a federal judge also ordered Kobach to pay $26,000 to the ACLU in legal fees and earlier held him in contempt of court over a Kansas voter fraud case.